The facility includes a main pool with zero depth entry and an Olympic size, eight lane, 50 meter swimming area. A stationary waterslide, 22 feet high with a flume extending 150 feet, is one of the main attractions of the pool. The pool also features a "Raindrop" in the zero depth area of the pool. A separate diving well includes both a one-meter and a three-meter diving board. Pool pass is $4.25. 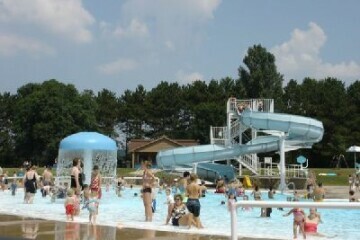 The pool is open from last weekend of May through the first weekend of September. Open Monday-Friday, 11:30am-7pm; Saturdays, 11:30am-6pm; Sundays, 1-6pm.